I love him and I love that he said this. I hear this a lot from my friends and clients regarding making a whole turkey, especially during the holidays. Let there be NO extra anxiety in the poultry department, k? Buying a well-raised turkey is more than half the battle, btw. I love to use Mary’s Chickens and Turkeys for my poultry option. I rest assured they have been humanely raised, not treated with antibiotics or hormones and always taste delicious. We’re gonna make this super simple! So… It’s Thanksgiving time and I won’t be in town for the holiday. While I’m semi-thrilled to be a guest elsewhere this year, I still wanted to make a little something to have in my house to get that full holiday feel leading up to my departure. To me, it doesn’t feel like holidays unless there is a turkey roasting in the oven. But, FYI, this doesn’t have to just be a holiday time thing, ya know. I sometimes will meal prep on a Sunday with making a turkey breast, so that I have fresh roasted turkey meat for sandwiches and salads ( I love to make a turkey cobb or turkey chopped salad) for the week. It’s a nice change up from the staple chicken breast. Its really very simple to make.. you do have to baste it along the way to ensure it stays moist and juicy, but again its easy and makes the house so doggone good. Try it! I double dare you. And then let me know how wonderful it was!!! Before seasoning, make sure to dry turkey breast well paper towels. Generously rub entire turkey breast with olive oil. Season liberally with kosher salt, pepper and paprika. Place Turkey in a baking pan, add ½ cup chicken broth to the pan and cover tightly with foil. Put in oven at 350 degrees for an hour. 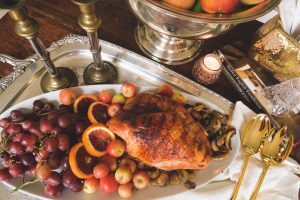 In a small bowl, mix together tangerine/orange juice, preserves and 1 ladle of the chicken broth drippings from the turkey to create a glaze to baste the turkey with. 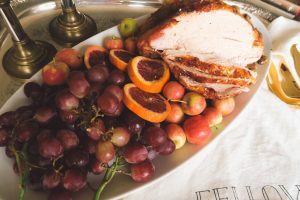 After an hour, remove foil and pour the glaze over the turkey and continue to baste with the glaze and drippings every 10-15 minutes until the turkey is fully cooked, which, depending on the size of your turkey breast and oven, could be another 45-60 minutes. Its best to use a food thermometer to be certain of when the turkey is fully cooked. If you’re using a food thermometer, the internal temperature in the center of the breast should reach 165F.